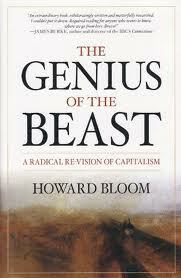 Multidisciplinary scientist Howard Bloom’s visionary new book, The Genius of the Beast: A Radical Re-Vision of Capitalism, to be published Tuesday, is an iconoclastic, big-picture view of the transformation of mankind by its machinery. It rewrites the history of the West, connecting science, technology, emotions, business and society, and proposes a next-generation of capitalism for western civilization — an evolutionary imperative that he suggests can lift us from economic crisis and dramatically upgrade our ability to empower our fellow human beings. “The Genius of the Beast seeks to reveal the deeper meaning beneath what we’ve been told is crass materialism,” Bloom says in the prologue. “It probes the mystery of how our obsessive making and exchanging of goods and services upgrade the nature of our species, giving us new powers, and endowing us with the equivalent of new arms, legs, eyes, and brains. Bloom, author of The Lucifer Principle: A Scientific Expedition Into the Forces of History and Global Brain: The Evolution of Mass Mind From The Big Bang to the 21st century, has discussed this book and his other works on the “Coast To Coast AM” late-night talk show. For a complete listing of his appearances click here.